Chop massive amount of vegetables in fine to small dice. Use sweet potatoes, celery, red, green and chili peppers, red potatoes, julienne of carrots, turnips or yellow beets, mushrooms, greens, etc. Start with onions, garlic and seasoning in a large wok or saute pan. Saute in a small amount of olive oil on high heat. Reduce heat as other vegetables are added. Cook uncovered, stirring occasionally to avoid burning for about an hour until the vegetables are soft but not mushy and excess liquid has evaporated. Open packet of large size rice flour egg-roll or won-ton wrappers. Working on the diagonal, place an amount of vegetable filling to create a roll approximately 1 to 1 1/2 inches diameter and about 3 inches long. Following package directions, wrap and fold over the ends of the wrapper around the vegetables, If the filling is too large, start over with a smaller amount. Place completed rolls seam side down on a lightly oiled baking sheet, leaving about 1/2 inch space around the rolls. When baking sheets are filled, brush with olive oil and place baking sheets in pre-heated oven 325 to 350 ° F. Cook for about 1/2 hour or more. Rolls should be crisp on the outside, soft inside. Rolls may be frozen or kept in refrigerator for a few days. 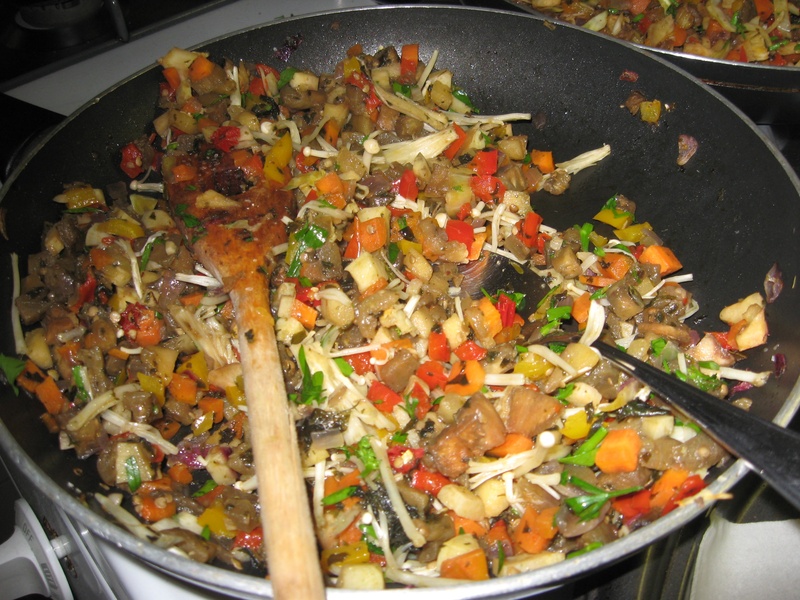 Serve with sauce of choice – green chili sauce, soy, oyster sauce, etc. This recipe was given to me by the Ethiopian parking lot manager during the 1990s when I complained that I couldn’t find a portable breakfast food that wasn’t sweet and starch based. He told me how to make these rolls in a few sentences and I’ve made them ever since varying the ingredients by season, adding dried fruit or seeds for accent flavor. Pel’meni – Siberian Meat Dumplings – hail from the frozen reaches of the Russian Far East. The dumplings are of Mongolian origin and the word Pel’meni is always plural, I was told by Russians. Apparently you can neither make nor eat just one..
Pel’meni warm tummies all over Russia and the countries that used to be part of the Soviet Union. It could be Russia’s answer to fast food — filling and ready to eat, assuming you have a supply of pre-made Pel’meni in the freezer or a local restaurant specializing in dumplings. Pel’meni are food for the masses, but not mass-produced. Workers chow down at pelmennaya (pel’meni restaurants) but the dumplings are still made by hand. I haven’t yet seen canned pel’meni by Chef Boyar. The boyars were the landed gentry class during Moscow’s formative years, some centuries ago. In permafrost regions, pel’meni were made in quantity, frozen and stored outdoors in sacks slung high away from dogs or other scavengers. Then the dumplings were cooked as needed. We can imitate those resourceful Siberian cooks by freezing the pel’meni on a tray and putting them in re-sealing freezer containers to be cooked later. Pel’meni can also be prepared and served immediately, but purists insist that pel’meni should be frozen before cooking. In the old days — and possibly in remote areas of Siberia today — cooks just took a frozen haunch of whatever mammal wandered into a trap and shaved or scraped off the meat needed for a batch of pel’meni. The traditional horsemeat filling might be difficult to find, or stomach nowadays. Modern Russians use ground beef, lamb and pork or mushrooms for the pel’meni filling. My first taste of Pel’meni occurred in St. Petersburg. Larissa Davidyuk, my Siberian-born hostess rolled, stuffed and folded a pel’meni mountain which three adults and a teenager leveled at dinner. Later, I read of a 19th century banquet at Lopashov’s Tavern in Moscow where twelve people dined on 2,500 pel’meni. [The Art of Russian Cuisine by Anne Volokh, Collier Books, 1983]. Like its kitchen-kin, ravioli, the bite-sized dumplings are made of ground seasoned meat wrapped in soft dough. They are cooked in boiling water or broth and served with butter, sour cream or vinegar. Sometimes pel’meni are served in the broth under a baked crust. Pel’meni shapes vary according to the cook’s preference and dexterity. Basically a small circle of dough is folded over a dab of meat filling, the dough edges are sealed and the ends brought together to make a loop. Larissa was my hostess in Moscow. A scientist, she was unemployed when I visited her in the mid-1990’s. She wrote her recipe in longhand and my Russian teacher at Montgomery College translated. Make an egg pasta dough: that was Larissa’s instruction for making the dough. Since she did not write a dough recipe for me, I adapted this from Please to the Table by Anya von Bremzen & John Welchman, Workman Publishing, N.Y. 1990. Using a mixer with bread hooks or food processor, blend four and salt, add egg, then add water gradually until dough forms a ball. Transfer to a floured surface and knead about 2 minutes until smooth. Cover and let stand for 1/2 hour. Larissa’s meat filling: Mix of 1/3 pound each ground lamb, beef and pork. Mix with salt, pepper, 2 tbsp. finely chopped garlic and the 1/2 cup minced whites of scallions. When I reached Siberia, I was eager to pursue the quest for pel’meni. In Khabarovsk, a port on the Amur River bordering China, the hunt for ultimate pel’meni took me to Natalya Mamadzhanova, a spirited businesswoman who opened a homey little restaurant specializing in Russian traditional food called V/Gostiakh u Natali, “As Natalie’s Guest”. To 1 pound of ground pork, add 1 large finely chopped onion and 6 chopped cloves of garlic. Roll out dough to about 1/8″. Make the pel’meni by putting filling on a small circle of dough. Fold dough over and seal. Twist ends of half-circle around to form a ring. In the cavarnous, heavily curtained dining rooms of what was once the Khabarovsk Intourist Hotel, pel’meni come to the table in a small ceramic pot which has been covered with a crust and baked. Meat mixture: 1 lb ground beef, salt, 1 1/2 cups minced onion, fresh ground black pepper. On a piece of dough the size of a half-dollar piece, place a small amount of meat mixture. Fold the dough over and press the edges together. Pull the ends around to make a halo effect around the top. Cook in boiling water, 5 minutes. 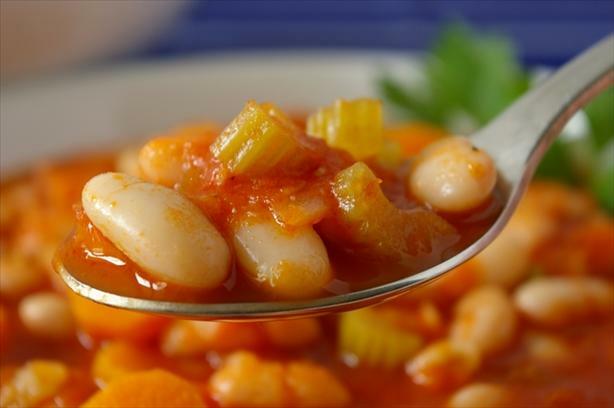 Place pel’meni in small serving crock. Add meat broth. Cover dish with a round of dough and press dough into sides of serving crock. Bake in oven. Serves 4. Sveta Gridin lives in Petropovlosk, the port city and capital of Kamchatka. A college student at the time I met her, she was maintaining a demanding course load while fulfilling the Russian woman’s traditional role of devotion to family, household and spouse. For her, pel’meni making is reserved for special occasions so I sampled Sveta’s pel’meni at a farewell party she gave for an American graduate student. 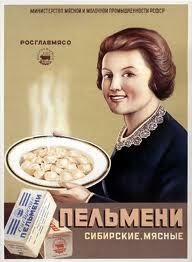 Her pel’meni are larger, more like meat dumplings and the cooking broth and vegetables form part of the meal. Filling: grind together 1 to 1-1/2 lb meat, 4-5 small onions, and salt and pepper. Dough: Mix 3 cups flour, 1 cup milk, 1/2 tsp salt, 3 eggs. Knead and refrigerate. Roll into log 3/4″ thick and cut into 1/2″ slices. Press or roll into circles 1 1/2″ diameter, 1/4″ thick. Back home, I researched pel’meni recipes in Russian cookbooks and I wanted to try the various recipes I’d collected in Russia. The dough recipes were all more or less the same, no problem there. I did chill the dough before rolling and cutting the pel’meni jackets. For the filling, I mixed ¾ pound each ground beef and pork, two minced onions, salt, pepper and a dash of ground clove. Labor intensive pel’meni shaping followed. After a half-hour of nimble fingered filling, sealing and turning, I realized why all the cooks I’d seen making pel’meni were sitting down and working in teams. Next time I convene a pel’meni party, I’ll invite the guests into the kitchen to cut dough and stuff. Classic Russian Cooking, Elena Molokhovets’ A Gift to Young Housewives, Translated, introduced and annotated by Joyce Toomre, Indiana University Press, 1993. Please to the Table, The Russian Cookbook, Anya von Bremzen and John Welchman, Workman Publishing, 1990. The Art of Russian Cuisine, Anne Volokh with Mavis Manus. Collier Books, 1983.
a half teaspoon! Tumeric is anti-inflamatory, good for human skeleton. Then you saute the onion, garlic and dry spices in a big cast iron fry pan or similar large skillet (with the little dab of oil listed with the spices) – ideally the mustard seed will pop like popcorn (medium high heat) so use a lid! Now before anything burns, but after the onions go limp and translucent, scoop in the marinated tofu with marinade if it isn’t too much liquid. The heat should still be medium, but you will probably want to reduce after the mustard seed has popped. Of course, you can omit the mustard seed too. If the fry pan is well seasoned, the tofu should start to form a crust. Expect some to stick and scrape back with a metal spatula to keep the tofu loose and browning on all sides. The next object is to bring all the tofu up to temp while not too gently browning the sides of the tofu cubes. This can take as long as 15 minutes. When the heat is right around medium-low, the fu will not stick too much as it browns and you can flip it every two or three minutes. If some of the cubes go the way of the Berlin wall – not too worry. The tofu can be served at this point as a flavorful cubes over rice with vegetables. Take the brief time between tofu flips to mix the rest of the goods in a stew pot, pressure cooker or slow cooker. When the tofu meets with your satisfaction, or you’re sick of flipping it, go ahead and toss it in the chili. Cook slowly over low heat for at least two hours. Test for flavor and consistency. Add liquid if necessary as the cooking proceeds.